If cinema is studied as part of the national cultural tradition, the national approach is justified and necessary. But there are also transnational developments that can easily remain overlooked as a result of choosing the country-by-country approach: what is observed in Polish cinema is often similar in Czech, Slovak and Hungarian film. The regional framework allows us to reveal leading stylistic or narrative trends and other general aspects, thus supplementing the scholarship on individual countries (p. 12). There is also a pragmatic reason to include cinemas of Poland, the Czech Republic, Slovakia and Hungary in one book. Many film academics and students might not need or cannot afford separate monographs on these respective cinemas and prefer to have one book which covers all of them. Against the background of a national cinema approach, Iordanova’s project stands out as unique. Rather than discussing Polish, Hungarian, Czech and Slovak cinemas separately, she regards them as a regional phenomenon and attempts to identify their common denominators. Her perspective hardly requires justification; due to their shared history over the past hundred years, particularly their being a part of the Soviet Bloc after the Second World War, the aforementioned countries were and are perceived as sharing a distinctive identity. Iordanova’s book is also pioneering because of its emphasis on some aspects of East Central European cinemas which were typically neglected in the previous studies, such as their industrial framework. Moreover, as a Bulgarian scholar who teaches East Central European film in Britain, she shows great sensitivity to the ways East Central European films are perceived and contextualised by indigenous audiences, critics and historians as well as those in the West. The aim to provide a comprehensive survey of the cinemas of Central Europe is indicated by the structure of Iordanova’s book which consists of three parts and an appendix. The first part, “Film and Context”, discusses such issues as periodisation of the history of cinemas of the ex-Soviet Bloc and the problems of re-mapping the cinemas after the prolonged division of Europe into “the West and the Rest” was removed in the 1990s and new political and cultural divisions appeared. In this part Iordanova also discusses the organisation of film production, especially the work of film studios, distribution, censorship, co-productions and migrations of filmmakers, and provides a survey of two “marginal” genres: animation and documentary. Part II, entitled “Film and History, Ethics and Society” is devoted to the most important themes, motifs and paradigms in the respective cinemas. Part III, ‘Films and Film-makers”, tackles the role of female filmmakers and feminist cinema in the cinemas of Eastern Europe and analyses representations of women in Polish, Czech and Hungarian films. A separate chapter is devoted to post-communist cinema. The appendix contains an overview of English-language resources for those who want to teach and study East Central European film. Iordanova concentrates on the cinemas of Poland, Hungary and Czechoslovakia, but on many occasions she also alludes to films from other countries from the former Eastern Bloc, such as Bulgaria and East Germany. The control of cinema under state socialism should be seen as a logical consequence of the state ownership of the film industry. Yet the owners did not exercise this control particularly effectively. Their censorship was plagued with irony: rather than preventing films from being made, the Communist state would often commit production funds that could have easily be withheld, but then shelve a completed film…This paradoxical situation was largely due to the semi-autonomous standing of the film units where most production decisions were made, and where mechanisms to evade direct surveillance and interference were developed. Within the units, ideological supervision was fairly relaxed and sometimes intentionally overlooked (p. 34). She notices that filmmakers could even afford to criticise censorship subtly in their films. Similarly, she contests the claim that cinema under socialism adhered to the rules of socialist realism. In fact, this style played a rather minor role in the history of Polish, Czechoslovak and Hungarian cinema, and the most famous filmmakers in those countries were not those who conformed to the rules invented by Andrei Zhdanov but those who subverted them. Furthermore, Iordanova draws attention to the fact that, as in Western countries, cinema in the countries of the Soviet Bloc was often used to promote nationalism. This feature largely explains the privileged position of lavish epics, typically based on literary masterpieces, in Polish and Hungarian cinemas. The author also offers some new insights into the artistry of the cinemas of the “Other Europe”, such as the problem of representing ethnic minorities, especially Romanies, and the portrayal of the Holocaust. However, despite her pledge to seek new ways to tackle Polish, Hungarian, Czech and Slovak films, which should result in re-assessing existing hierarchies within these cinemas and the region as a whole, Iordanova largely uses the perspectives which dominated previous studies of these cinemas and conforms to the long-existing hierarchies of film themes, paradigms and individual filmmakers. In particular, as in most studies of Central European cinema which take a country-by-country approach, the political dimension of a film proves more important to her than its artistic value and popularity amongst ordinary viewers. For example, in her treatment of Polish cinema she concentrates on the work of a handful of directors, such as Andrzej Wajda and Krzysztof Kieslowski, who are already well known to Western viewers, largely because of their importance for the discourse on national history and morality, marginalising the filmmakers whose interests lay elsewhere. This applies especially to Wojciech Jerzy Has, perhaps the most original filmmaker born on the Polish soil (whose work has only begun to receive due acknowledgement in Polish film studies). Not only does she devote less space to his work than to that of Kieslowski, but she fails to appreciate fully his mastery and place in the national and regional context. More worryingly, she completely omits from her discussion Marek Koterski, the most talented, uncompromising and popular filmmaker in Poland in the last two decades, whose most recent film, Dzien swira (Day of the Wacko) (2002) is justly regarded as the most revealing cinematic analysis of the “postcommunist mind”. Furthermore, in various parts of the book the author abandons her principle of looking at the cinema of Central Europe as a whole and uses the national approach. In particular, she discusses separately the Czechoslovak New Wave and Polish Cinema of Moral Concern, although both movements are well covered in previous publications which applied a “national” approach, and both could productively be situated in a regional, rather than a national context. Lastly, Iordanova’s discussion of many film movements and individual films, although competent, comes across as based on secondary sources and her trust in the authorities in the respective areas, rather than first-hand experience of the films discussed. However, despite these shortcomings Cinema of the Other Europe is a groundbreaking work, inviting the readers to develop further many issues which Iordanova mentions only briefly, such as socialist “popular cinema”. Moreover, it provides a necessary tool for the work of academics specialising in Polish, Hungarian, Czech, Slovak, or even Russian cinema, and is a useful addition to the library of every film scholar whose definition of “Europe” extends beyond “Western Europe”. 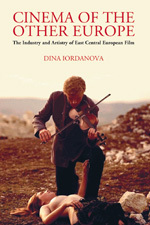 Cinema of the Other Europe: The Industry and Artistry of East Central European Film, by Dina Iordanova, Wallflower Press, London, 2003.